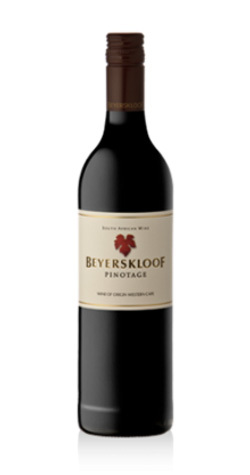 The Beyerskloof Pinotage boast with being South-Africa’s most popular Pinotage, and it’s no wonder. This wine has shown a fruity and enjoyable consistency year after year. Strong plum flavours with velvety tannis. Well structured, yet elegant and soft, medium-bodied with a fresh and superbly balanced finish. Impressive for consistency, given the volume produced of this specific vintage. For a full flavoured experience we recommend drinking young. Different systems of skin contact and fermentation in open fermenters, roto tanks, and fermentomatics. 4 to 5 days on skins at 25°C. After malolactic fermentation, the wine was treated with oak. Beyerskloof winery, the quintessential king of Pinotage and a charming family-run farm lies in the Cape Winelands of South Africa, overlooking Stellenbosch's grand Simonsberg mountain and producing fine and exceptional wines. From Dr. Leoanrd of Holt, Michigan on 8/2/2018 . I fell in love with Pinotage almost ten years ago when I visited South Africa for the first time. Nine visits and years later and hands down the best pinotage I've had is Beyerskloof Pinotage. There is a reason they call the proprietor the King of Pinotage. Get a bottle and find out for yourself today!